Here are the linebacker progression drills we did at our international youth football camp in Vienna, Austria. 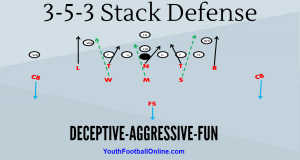 These drills focus entirely on the fundamentals of linebacker play. All of these drills are easy to install and they need to be implemented in progression. The linebacker position is a very difficult position to coach. Finding linebackers is very difficult on the youth football level. These drills will help develop the linebackers you have to work with. We do these progression drills every single practice. The stance is a very underrated aspect of playing linebacker. It’s just as important as an offensive line stance is to offensive linemen. You want to really emphasize stances. My linebacker coach will really rip into our kids if they aren’t in a good stance. A good stance will allow your linebackers to take an explosive read step and it will allow them to explode downhill. It will also make them look like they are ready to play football. I’m very big when it comes to body language and posture. Looking like you are ready to play football is half the battle! Line the linebackers up across the field on a line. This will save time and allow you to evaluate all the linebackers at one time. You can also make 2-3 lines if you want to really focus on each individual. Keep hands ready to shock and shed. Good bend in knees and back straight. This is a great drill because it implements the proper stance technique they were taught in drill # 1 and it also teaches proper pursuit. One of the most important aspects of solid linebacker play is pursuit. Your linebackers have to understands where they are on the field and know how to take a proper angle to the ball carrier. Break the linebackers up into two groups. Each group goes twice. Coach/RB goes right, then the kids reset then the coach goes left. You will need a few cones. If you don’t have enough coaches have one of the players play the running back. Coach is the ball carrier. Linebackers line up 10 yards away. Coach goes either right or left. Linebackers start in a good stance and take a downhill path to the ball carrier. It’s important to work inside to out and the aiming point is the inside hip of the ball carrier. Focus on stance taking a good pursuit angel to the ball carrier. This is very important, they cannot chase laterally! The shock and shed drill is a very good drill that will teach your linebackers how to destruct blocks and make a tackle. This drill will take the techniques learned in the first two progression drills and put it all together. It’s important that your linebacker coaches really focus on stance, pursuit angle, shock and shed, and a solid form tackle. Extend arms “shock the blocker”, hands inside, get separation, find the ball carrier, shed the block, and then form tackle. Execute this drill exactly like the video.